Skeletal muscles consist of 100,000s of muscle cells that are also known as 'muscle fibres'. These cells act together to perform the functions of the specific muscle of which they are a part. This is possible due to the integration of the muscle with the other tissues and structures of other associated body systems - especially the bones (skeletal system) or, in the cases of facial muscles, the skin (integumentary system), and also the nerves (nervous system). A general example of the structure of muscle and associated tissues is shown below. Periosteum is the outer layer of bone (as illustrated below). It is to this layer that ligaments and tendons are attached. They are tough pale coloured (whitish) cords formed from many parallel bundles of collagen fibres. Tendons are flexible (they bend around other tissues, changing position as they move), yet inelastic. Some tendons are surrounded by tubular double-layered sacs that are lined with synovial membrane and contain synovial fluid. These structures are called 'tendon sheaths'. Their purpose is to minimise friction associated with movement at the join, and to facilitate movement of the joint. The word 'fascia' means bandage - a fitting analogy as the tissue called fascia takes the form of sheets or broad bands of fibrous connective tissue that cover muscles or organs, forming an outer-wrapping. Superficial fascia consists of areolar connective tissue and adipose tissue, and may also be referred to as the 'subcutaneous layer' of the skin. Deep Fascia is more relevant to the study of muscle structures because it is deep fascia that holds the muscles together. It consists of dense fibrous connective tissue. The type of muscle that causes movement of the skeletal system (especially limbs), and of skin in the cases of the muscles of facial expression in the head and neck area has many names. These include "skeletal muscle" (because it moves bones), "voluntary muscle" (because it is usually under conscious control), and "striated muscle" (because they have a striped appearance). Perimysium is a fibrous sheath that surrounds and protects bundles of muscle fibres. Epimysium is fibrous elastic tissue that surrounds muscle. There are usually many muscle fascicles that form a single muscle. 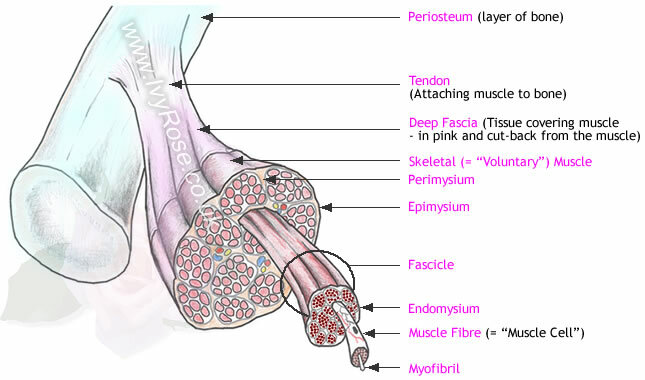 Epimysium surrounds the total bundle of many fascicles - as compared with perimysium (the fibrous sheath that surrounds and protects individual fascicles, filling the spaces between the fascicles within the bundle of fascicles that forms the muscle itself), and endomysium (the fine connective tissue that surrounds and protects each individual muscle fibre - also known as a 'muscle cell', hence filling the spaces between muscle fibres within each muscle fascicle). The word fascicle (sometimes expressed as a 'fasciculus'), refers to a 'bundle', such as a bundle of muscle fibres e.g. as illustrated above, or alternatively a bundle of nerve fibres. Endomysium is the name of the fine connective tissue sheath that surrounds/covers each single/individual muscle fibre. Muscle fibres, also known as 'muscle fibers' (American spelling) and 'muscle cells', are special cells that are able to contract, thereby causing movement - of other tissues/parts of the body. Cardiac muscle (forming the walls of the heart). For more about the structure of muscle, see the more detailed page about the structure of a muscle cell.